Dozens of flights were cancelled across the UK as freezing fog descended overnight and the country woke up to icy conditions. 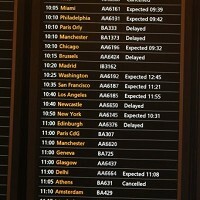 Around 60 flights were cancelled at Heathrow Airport early today, with the airport having started announcing cancellations on Tuesday night before reporting several more this morning. A spokesman explained that fewer planes per hour can be landed in fog and therefore it is sensible to leave a bigger time gap between services. And by cancelling in advance it gives airlines more chance of accommodating passengers on other services, the spokesman added. Inbound and outbound flights have been affected, including scheduled services to Warsaw, Stockholm, Nice, Aberdeen and a number of cities in Germany. Six early morning flights from London City Airport to European cities were also cancelled, with the airport's Twitter feed saying "flight disruptions are present and expected to continue until further notice". The spate of flight cancellations and delays due to inclement weather may act as a reminder for holidaymakers to ensure they have adequate travel insurance in place so that they do not lose out if their travel plans are affected.